The Global Royalty Financing Partnering Terms and Agreements in Pharma, Biotech and Diagnostics 2010-2018 report provides comprehensive understanding and unprecedented access to the royalty financing agreements entered into by the worlds leading biopharma companies. The report provides a detailed understanding and analysis of how and why companies enter business, royalty financing agreements. The focus of the report is on partnerships for royalty assets where partners have entered an agreement to dispose of or acquire said assets. The report provides access to royalty financing deal payment terms as announced between the parties. This data provides useful insight into the payment and other deal terms. Understanding the flexibility of a prospective partner’s negotiated deals terms provides critical insight into the negotiation process in terms of what you can expect to achieve during the negotiation of terms. Whilst many smaller companies will be seeking details of the payments clauses, the devil is in the detail in terms of how payments are triggered and rights transferred – contract documents provide this insight where press releases and databases do not. This report provides comprehensive access to royalty and revenue financing deals as announced in the life sciences industry since 2010. This report contains links to online copies of actual royalty financing contract documents as submitted to the Securities Exchange Commission by biopharma companies and their partners. The initial chapters of this report provide an orientation of royalty financing dealmaking and business activities. Chapter 1 provides an introduction to the report, whilst chapter 2 provides an analysis of the trends in royalty financing dealmaking as well as a discussion on the merits and attributes of royalty financing dealmaking. Chapter 3 provides an overview of the structure of royalty financing deal contracts. The chapter includes numerous case studies to enable understanding of royalty financing deals for royalty assets. Chapter 4 provides a review of the leading royalty financing deals since 2010. Deals are listed by headline value. Where the deal has an agreement contract published at the SEC a link provides online access to the contract. Chapter 5 provides a comprehensive listing of royalty financing contract documents since 2010, including deal value, press release and contract document. The chapter is organized by company A-Z. Chapter 6 provides a comprehensive listing of all royalty financing deal announcements and agreement contracts since 2010 available in the public domain. The chapter is organized by company A-Z and therapeutic area. Each deal title links via Weblink to an online version of the deal record and, where available, the contract document, providing easy access to each contract document on demand. The report also includes numerous tables and figures that illustrate the trends and activities in royalty financing dealmaking. In conclusion, this report provides everything a prospective dealmaker needs to know about royalty financing, enabling thorough learning, education and due diligence prior and during the royalty financing dealmaking process. 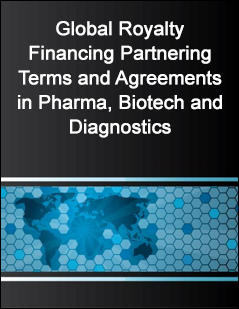 Global Royalty Financing Partnering Terms and Agreements in Pharma, Biotech and Diagnostics 2010-2018 is intended to provide the reader with an in-depth understanding of the royalty financing trends and structure of deals entered into by leading biopharma companies worldwide.